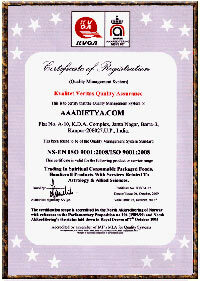 Astrojyotishi.Com is owned and managed by Aaadietya.Com (an ISO 9001 : 2008 Certified Co.) with the aim of helping the masses through its motto "right guidance at the right time in the right manner is the key to success". Astrojyotishi.Com is the portal for research and guidance through Vedic Sciences like Astrology (Vedic Jyotish), Numerology (Ank-Shastra), Palmistry (Samudrika), Vaastu Shastra and offer genuine and best quality astrological remedies and spiritual products to the clients at affordable rates. Astrojyotishi.com is also undergoing Research projects in Vedic Astrology,Numerology and Vastu shastra under the guidance of its patrons Pt. Vvidhushekhor Pandey & Dr. (Pt.) Aaadietya Pandey. Dr. (Pt.) 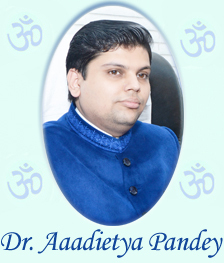 Aaadietya Pandey has researched new theories of Numerological analysis and generating Numeroscope based on Vedas. Pt. Vvidhushekhor Pandey has guided thousands of people with his spiritual powers and Siddhi of Goddess Mahakaali. Astrojyotishi, Astro Jyotish, Aaadietya and Rudraksha Healing are the internationally registered Trademarks of M/s Aaadietya.com. Pt. 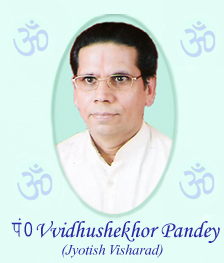 Vvidhushekhor Pandey was born in 1947 and brought up in the spiritual atmosphere of Mathura and Vrindawan. Pt. Vvidhushekhor ji spent his childhood in a holy atmosphere and developed spiritual powers at an early age. As an ardent devotee of Maa Mahakaali, Pt. Vvidhushekhor ji developed spiritually and has guided people from every walks of life. In his experience of nearly 40 years he provided free of cost services to the needy. In the year 2002, Pt. Vvidhushekhor ji decided to take it as a profession on the request of his followers and disciples. Pt. Vvidhushekhor ji has been awarded the title of Jyotish Visharad, Jyotish Praveen and numerous honorary titles in Astrology, Numerology and Vedanta. Pt. Vvidhushekhor ji has guided thousands of people through Astrology, Numerology, Tarot, Graphology, Gem-therapy, Palmistry and spiritual methods. Pt. Vvidhushekhor ji is known for his knowledge of various subjects ranging from Physiognomy, Ayurveda, Homeopathy, Accupressure, Accupuncture, Reiki and Vaastushastra. In the words of Pt. Vvidhushekhor ji, "Every problem has a solution. If there is no solution then it means that the problem also does not exist". Pt. Vvidhushekhor ji is well taught and experienced in all kinds of tantra as per the guidance of Maa MahaKaali. Pt. Vvidhushekhor Pandey prefers to follow the spiritual methods and strongly opposes 'Tantra' because he believes that tantra has a negative after-effect, whereas mantra is equally powerful and has no negative repercussions. Pt. Vvidhushekhor Pandey believes in the powers of mantra and yajna. Pt. Vvidhushekhor ji 's articles, predictions and interviews have been printed in newspapers like The Times of India, Hindustan Times, Dainik Jagran and other leading newspapers and magazines. Pt. Vvidhushekhor ji has also been interviewed many a times for predictions, jyotish Q&A and planetary transit effects by television channels. The Times of India remarked, "This father-son duo plays a number game. " Dr. (Pt.) Aaadietya Pandey is the youngest Astrologer - Numerologist known world over. Pt. Aaadietya is born on 30th January 1985. He developed spiritual powers at the age of five and in his experience of more than 20 years he has guided thousands of people. Pt. Aaadietya Pandey is known for his accurate and precise predictions. Pt. Aaadietya Pandey is a Doctors of Medicine, Hony. Doctorate of Science, and also awarded honorary doctorate in Vedas & Rudrakshas in many International Conferences held globally. 'Sonia Gandhi will NEVER become the P.M. of India. Pt. Aaadietya Pandey is always approached by leading newspapers globally for predictions. Not only is Pt. Aaadietya an expert in the science of numerology, astrology, palmistry, physiognomy, graphology, gemology, psychoanalysis, and Japanese Numerology but also a genius in Vedas and Rudrakshas. Pt. Aaadietya has been honored with the title of 'Ved Vaachaspati'. Pt. Aaadietya contributes Columns for for leading newspapers in India like Hindustan Times, Inext, Deccan Chronicle, The Times of India, Asian Age, Amar Ujala. World media has recognized Pt. Aaadietya as the youngest Astrologer - Numerologist globally. Hindustan Times remarked, " This lad is on a date with infinity." The Times of India said, " Pt. Aaadietya plays a number game and cures problems miraculously." Pt. Aaadietya is not only an ardent devotee of Maa Kaali but also a meritorious gold medalist student and a mathematician who has developed a "Theory for infinity Calendar" . He is the fastest human calendar on earth and will soon be acknowledged by the Guinness book of World Records. Pt. Aaadietya 's clientele extends in more than 180 countries with prominence in U.K., USA, Canada, Singapore, Australia to Dubai, Oman, Pakistan, Bangladesh, Tanzania, Egypt, Netherlands, U.K., Surinam, Tirinad & Tobago, Brazil and Japan. In the words of Pt. Aaadietya Pandey, "Success means - right guidance at the right time. And this is what I give my clients and followers. I do not teach them to walk, I just guide them the direction in which they must move. " "I believe in the power of karma, the power of efforts. Man is the creator of his own destiny and astral sciences are there to guide him in doing the right karma at the right time." Hony. Doctorate in Philosophy (Astrology & Numerology) - Ph.D : by a University in the U.S.A.